Educational Music - Make Learning Fun! Educational music is a powerful tool that teachers can use to promote learning. I love to sing and dance with my students because there's an emotion that music triggers that just makes your classroom a happier place. One of my favorite things to have in my room is a music center. I fill it with my favorite tunes and the kids can sing and dance their way to literacy! You need to teach sight words. You need the kids to learn sight words. You are freaking out because of sight words. No fear, HeidiSongs are here. This fun yet educational music teaches the words kids need to know. I use these almost daily. Right now I can't get enough of Mark D. Pencil and Friends . 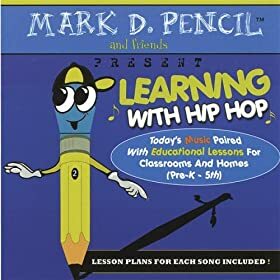 My kids love the fun hip-hop learning this CD provides. Our favorite songs right now are: Following Directions With Exercise, The Rhyming Game, and I Can Count to 100. I have students that beg to dance to Following Directions With Exercise daily. I love this CD because it teaches many of my standards, my kids love it because it is fun! 3) Dr. Jean - Kiss Your Brain! Dr. Jean - Kiss Your Brain CD is one of my favorites because it has "The Alphabet's in my Mouth" on it. This CD also has "Who Let the Letters Out?" My students go wild for this song! They love to "rap" the sounds and dance around. But... if you're looking for a great song about friendship, you can't pass up "Twinkle Friends". Every time my kids and I sing this song I'm just about brought to tears. It is just perfect for building a classroom community! Dr. Jean comes from an amazing educational music background and knows what kids want in their music. Her CD DR. JEAN AND FRIENDS has some of my favorite songs like "Tooty Ta", "Macarena Months" and "Days of the Week". Last year I started playing "Macarena Months" in August, and by the end of September all of my kids could say them all in order. To me, that's the sign of a good song! One of my favorite CD's to use in the classroom is CJ's FUNdamentals. It has a great style and beat. It's just fun to listen to! My personal favorites are "5 Little Monkeys" and "Down By The Bay". These are upbeat, exciting and get my students ready to go. I really like to use these in the morning to get my students "blood flowing" and wake up their brains. When I say, "Alligator Chomp" in my classroom, my students go wild. If they hear, "Shake Your Hands" they jump up and down. "Body Math" gets them in a frenzy! This is what I want in a math lesson! Jack Hartmann really got it right with Math All Around Me:Making Early Childhood Math Fun Through Music 'N' Movement. This CD has counting, patterns, calendar, days, months... Everything a primary teacher would want in educational music. A great compliment to any math curriculum is TOTALLY MATH. My kids love "Techno Count to 100". It gives them great joy to do it! I like it because it wears them out. I also really love the "Addition Pokey" because it makes addition facts fun and easy to remember. There's also a great version of "Five Little Monkeys" that I use during the week that we do our literature panel on the book. There is so much to say about the Fun Phonics Factory CD. It is a great educational music tool that gets used over and over in my classroom. If you're teaching letters sounds, then you need "Fun Phonics Song". Want to focus on sight words? Then use "Blend the Sounds Together" (see photo). Working on blends with long and short vowels? Then "The Blend Song" is for you. I really love to throw this CD into the player as a center. The children can write along with many of the songs, and they have great beats, so it keeps them interested. I saw Coleen Richey-Reed at a conference a few years ago and have been a huge fan ever since! Do you agree with my top list? to use in your classroom? Do you have a great CD you use? Do you have some amazing lessons that go to music? Share them so we all can learn! Have questions? Contact me about educational music.